Pineapple is a predominant flavor in the cocktail world. Second only to orange juice, pineapple juice is one of the necessary mixers to keep on hand for making cocktails. It's such a popular flavor that there are now several branded pineapple vodkas and pineapple rums on the market. There's even pineapple whiskey and tequila out there. 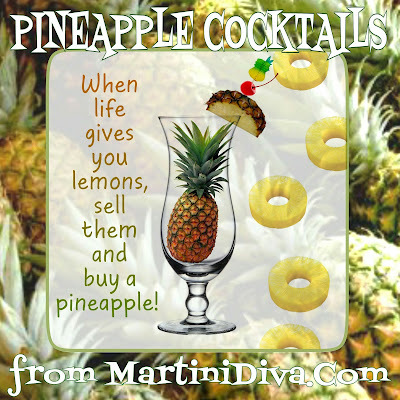 Pineapple is a main flavor in most Tiki drinks and it's an absolute necessity for Pina Coladas, but Pina Coladas are not the only way to enjoy pineapple in a cocktail. Rum is, of course, the first thing most people think of when mixing up pineapple cocktails, but it also stands up to beautiful whiskies and aged tequilas, not to mention playing nicely with vodka and gin. If you're looking to finally branch out from that o.j. drenched drink, here's a great list of pineapple cocktails to help lead you astray. The word "pineapple" derives from the Spanish word "piña", originally applied to pine cones, it was later adapted to the pineapple fruit when it was introduced to Europe. Discovered on the Caribbean island of Guadalupe in 1493, the Portuguese and Spanish introduced pineapples to Asia, Africa and the South Pacific. Pineapples were first cultivated in Hawaii in the 18th century and Hawaii remains the only U.S. state to still commercially grow pineapples. The Pineapple is a member of the bromiliad family, one of the few bromiliads that produces an edible fruit. The fruit is composed of berries in the form of scales. Pineapple contains high amounts of vitamin C, thiamin, manganese and anti-oxidants as well as bromelain. Bromelain is an enzyme that breaks down protein (one of the compounds that can tenderize meat) which aid in digestion. Pineapple can reduce the risks of sinus inflammation, blood clots, macular degeneration, heart disease, osteoporosis and may also be helpful in reducing the risk of osteoarthritis and tumor growth. Like anything else, too much of a good thing can be dangerous and pineapples are no exception. The bromelain can cause a tenderness in the mouth, the high quantity of vitamin C in pineapple could result in diarrhea, nausea, vomiting, abdominal pain or heart burn if one consumes too much and, of course, there are pineapple allergies that can cause a rash, hives or breathing difficulties.